Starwood Preferred Guest (SPG) members can earn 250 bonus Starpoints per stay and get two sodas by booking a special rate plan at Four Points hotels in the Americas and the Caribbean for stays between May 1 and July 15, 2014. You must book by June 30. The bonus Starpoints rate plan seems to be tied to the Best Available Rate (BAR) and you should check all the rates so that you are not overpaying for bonus points and two sodas. You can access SPG’s website for this offer here. The bonus points rate seems to be the same as the Best Flexible Rate. Unless someone else is picking up the tab, I would probably book one of the discount rates by myself and pocket the difference. This rate offer will work best when there are no discount rates available for booking. Just make sure that you are not overpaying for points and make sure that you choose the bookings engine to show all the rates. • Offer is valid at participating Starwood hotels and resorts in North and South America. • Reservations must be booked online through this offer or through a Starwood Customer Contact Center. If making a reservation through a Customer Contact Center, callers must mention rate plan FPFIFA. • Offer is valid for stays booked May 1, 2014 through June 30, 2014. • Offer is valid for stays May 1, 2014 through July 15, 2014. • A minimum stay of one (1) nights is required at hotels while the minimum night requirement will vary at resorts. • These offers are based on Starwood’s best available unrestricted retail rates. • Advance purchase required. Credit card will be charged at time of booking. Reservations cannot be changed, are pre-paid and non-refundable; if cancellation takes place, guests forfeit total room charge plus tax. • Offer is only valid for bookings made using rate plan FPFIFA. 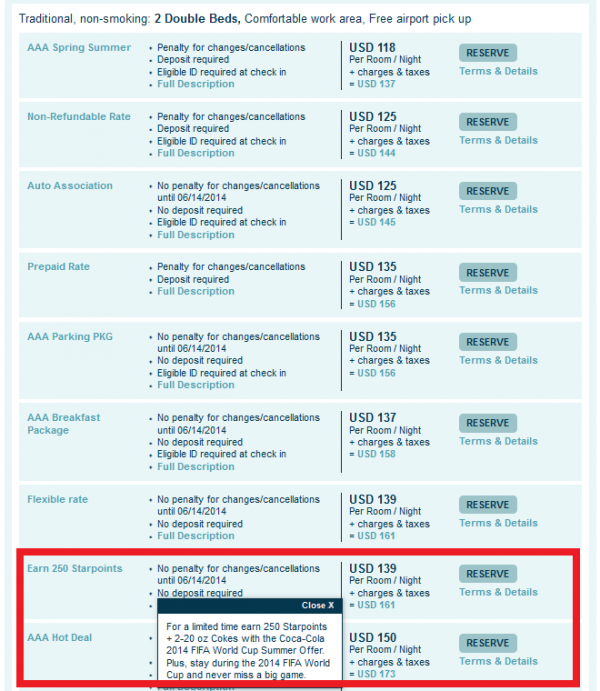 For reservations not confirmed through this offer in advance, no savings will be applied upon departure. • This offer is valid only for members of the Starwood Preferred Guest (SPG) program. A valid SPG member card is required at check in to receive these rates. Membership is free. To become a SPG member, visit SPG.com. • 250 Starpoints® per stay will be credited to the member’s account within 4-6 weeks of the stay posting to the member’s Starwood Preferred Guest account. • An eligible stay is defined as 1 or more consecutive nights paying a qualifying rate in the same hotel regardless of the number of check in or check outs that occur and post to the member’s Starwood Preferred Guest® account. • All promotions are subject to the Starwood Preferred Guest program terms and conditions, which are subject to change without notice, and can be found at SPG.com. • An SPG Member may earn 250 bonus Starpoints per Eligible Stay at a participating hotel or resort if he/she stays in one of the reserved guest rooms and pays an Eligible Rate.